Neighbors Opposed to Privatization at Earle: Navy: "No, that's MY sandbox and bus yard!" One could argue that this is what Colts Neck gets for suing the Navy over its unimpeded access plan for Laurelwood housing, but in perhaps one of the cattier actions imaginable, NAVFAC Mid-Atlantic (i.e., the Department of the Navy) recently wrote to Colts Neck, denying the Township's request to continue to use the 3.4-acre tract alongside Rt. 18 that NWS Earle had conveyed a decade ago to the Township for "use as a school bus parking area, public recycling collection center, and dirt/sand storage area" (quoted from a 1999 letter to former administrator George Handzo and obtained by NOPE). 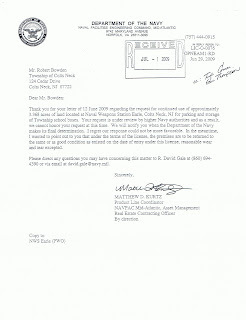 In essence, someone working for the Navy in Washington - presumably R. David Gale, the attorney cited as the contact person in the letter (attached to the right) - decided to punish the township by taking away what is otherwise a useless (to NWS Earle) strip of land where school buses are parked and where residents drop off their recyclable materials. So much for being a good neighbor. (Mr. Gale's contact info is on the letter, if you seek an explanation or clarification for yourself). Our personal views of this sideshow notwithstanding, this letter is yet another snapshot of the uphill battle that the civilian neighbors of NWS Earle face in challenging - even through respectful and proper channels - a branch of their country's own Armed Forces, particulary when (in this case, the Navy) does not get its way without a valid challenge. The notion of putting civilians on an active weapons depot is absurd, but because the citizens of the neighboring towns have organized, spoken out by the thousands against the plan thru NOPE and gathered bipartisan political support as high as the U.S. Senate - and called the Navy's bluff, so to speak - someone in Washington is going to take away Colts Neck's bus storage yard and recycling dropoff point as a symbolic gesture. Boo hoo. The more entrenchend you become in this issue, the more you will realize that your Navy leadership in Washington will try to do whatever it pleases at Earle (re: Laurelwood), regardless of the security, financial and environmental detriment to the surrounding communities and to the NWS Earle's mission itself. In this case, going thru with an 80s-era privatized housing contract that the Navy can contractually void, but would rather not to avoid embarassment, being candid about its true motives or to go full bore with the undetermined selfish pursuits of certain military leaders in Washington. This letter is about more than a bus storage yard. Basically, it is another perspective of "heck with what's right for the Monmouth County communities" (namely Colts Neck and Tinton Falls) that for nearly 70 years have done nothing short of embracing the U.S. Military's presence here, being a respectful friend and neighbor and educating thousands of children of families stationed at Earle over the years. Shame on you, NAVFAC!